« Happy 2/3rds old, 80! She LOVED IT. This is what she’s wanted all along. She happily gnawed on the apple (both soft side and skin side) for a good long while. She cried when I took it away (she’d been rubbing her eyes so furiously, I knew we needed to get her cleaned up and on to napping pronto). The look in this picture is her “extreme pleasure” face. The big lesson is that the baby-led weaning book I love (Baby-Led Weaning: helping your baby to love good food)* really does know what they’re talking about. 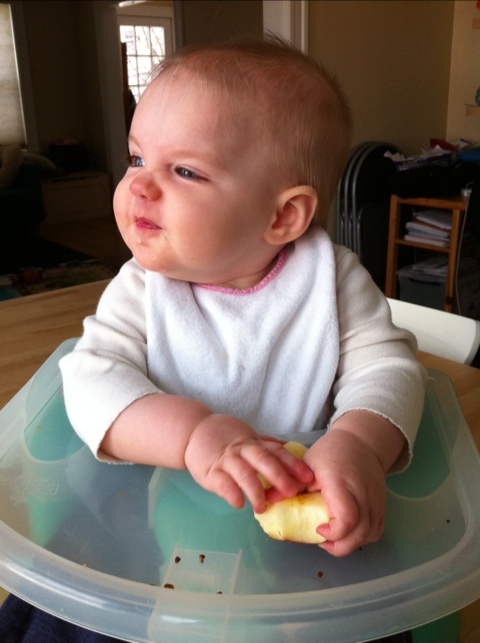 There’s a picture of a baby nomming on a whole apple, and I thought “yeah, maybe in a few months”. Also, I remember my friends Abby and Sara having to keep apples on hand at all times, when their son would nom on a whole one for a snack every day. They’d have to keep track, so the chewed-on apple didn’t end up forgotten under his bed, since he took it to play with him all over their house. The word “apple”, much like the word “fork” will become hilarious as 80 learns to say them, and yet sounds more like she’s swearing a blue streak. Remind me to take a video of her narrating eating an apple with a fork. *which is now “translated” into American English, so courgette becomes zucchini and spello-tape becomes Scotch tape. One of the authors left a comment here, to let me know. This entry was posted on Thursday, January 20th, 2011 at 12:22 pm and is filed under Bucket Of Sunshine. You can follow any responses to this entry through the RSS 2.0 feed. You can leave a response, or trackback from your own site. Apples were also awesome just to occupy him. It was so much fun to have a whole apple that he’d forget everything else and just eat his big giant apple for hours. He still thinks it’s lame when someone hands him a slice of apple, and insists on a whole one. I’m really glad you made a Tick reference. This is why you’re my new best internet-friend. Yeah, I couldn’t resist videotaping Ian during a brief “fork” fest. It sounded so inappropriate. I decided that, between Isaac’s initial relunctance to talk, and Ian’s seemingly profane requests for a fork, that my children are, in fact, Jay and Silent Bob. i like that her extreme pleasure face is also a bit of a snarl. makes me know she’s got a bit of the resistance in her, like her mum and dad.